The girls in my family don't have daddies. Oh, sure, someone sired them, contributed some genetic material to the cellular mix. But they don't grow up with daddies who build tree houses and teach them to drive and give stern lectures to their prom dates. My grandma Jenny and her sister, their daddy (my great grandpa Clem) got sent to federal prison for fraud when they were in pigtails. Eventually he must have gotten out, but he sure never came home. Grandma Jenny was a real wild child, and my mama has no idea who her daddy is. She told me once she thought about trying to figure it out, but none of the possibilities were particularly appealing. She decided she'd rather pretend she sprang fully formed from a pack of Grandma Jenny's Virginia Slims. My Aunt Tally's daddy, he had a second family up in Tulsa. When Tally's mom found out, she gave him the heave-ho, and Tally never saw him again. Me? My dad's name is Sonny Anders. I think I remember him--the strong scent of bitter coffee and Listerine, the flash of his too-white smile, and his strong, sinewy arms tossing me above his head. But, when I'm being honest with myself, I realize I've just created that memory from the handful of snapshots of him we've held onto and the few precious memories my mother has shared in moments of weakness. He left when I was two. One morning, he got up before my mama. This, I do remember. He made me cereal--Cheerios with mini marshmallows and raisins, just like I liked it. He let me get settled on the couch, in front of the TV, and nestled the bowl in my lap. Eating in front of the TV was a big treat. Then he kissed me on the top of his head, sauntered out the front door, and drove off with a drugged-out stripper named Spumanti. He whistled that morning as he fixed my breakfast. I wish I knew what melody it was. Every now and then I think I catch the tune in some song on the radio, but then the memory slips away like a wave retreating from the shore. Gone. My mom and my Aunt Tally grew up just fine without daddies, and I think I've done o.k., too. I don't really miss Sonny Anders, because you can't miss something you don't remember. But sometimes, when I'm being honest with myself, I miss having a dad. I watch movies and TV shows with touching father-daughter moments, and I feel cheated. I don't want the real Sonny Anders, the one I know in my head. The one who left my mother with a toddle and an overdue electric bill. The one who never even sent me a postcard. I want this dream daddy ... the one I know in my heart. The one I always hoped would show up on our doorstep but who never, ever did. A note from Wendy: Alice's wish for a daddy may be coming true ... but not in a way she ever dreamed. Be sure to check out A Parfait Murder (available June 7) to find out what happens!! Ooooh! 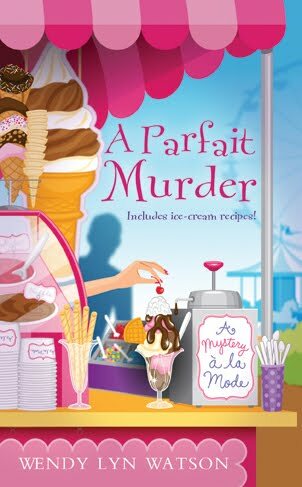 Can't wait to read A Parfait Murder! How interesting must your father's days have been!!! Alice I know how you feel as I grew up without a father who left and then would pop-up for a day or two and then, well that's another story. I also use to have a dream daddy who was kind and listened to what I had to say. Wendy, you are a tease, first with the identity of Tally's boyfriend now with a visit from Alice's father. Can't wait to get my hand on this book.